Well this is a fun sale to stumble on! Right now on Amazon there is a massive sale to Save $20 When You Spend $100 On Best Selling Toys. 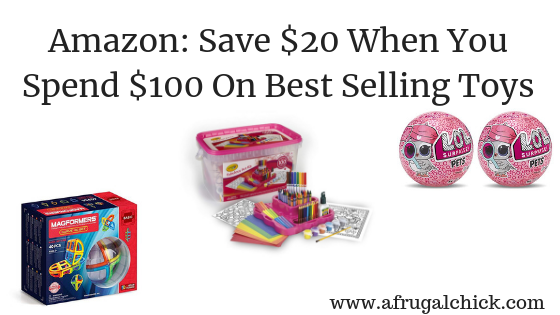 It includes Nerf, Barbie, Trolls, Dress Up Clothes, Barbie, Shopkins, Fisher-Price, Elf on the Shelf and so many more. These are all best selling toys- there are not alot of duds included. I have to run out the door so I don’t have time to work up scenarios for you but I will try to this afternoon. I have no idea how long this sale will last so hopefully it will still be there when I get home. But if you have toys to buy please click HERE and see if you what you need it included- some of the items and already marked down BEFORE the extra $20 off!